I enjoy helping people meet their visual needs so they can continue to live an active and independent lifestyle. 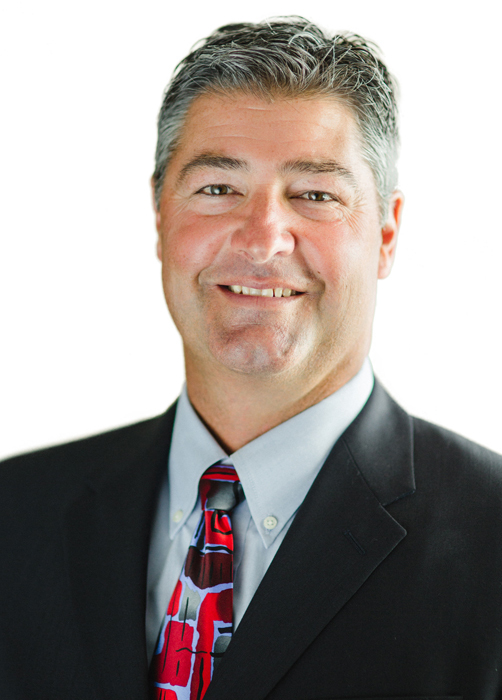 Todd Lumsden, DO, FAOCO is a graduate of Mankato State University and the University of Osteopathic Medicine & Health Sciences, College of Osteopathic Medicine & Surgery in Des Moines, Iowa. After completing his internship and a residency in ophthalmology at Millcreek Community Hospital, he pursued a second residency in ophthalmology at Metro Health Center in Erie, Pa. Dr. Todd Lumsden joined Eye Consultants, Inc during the summer of 1997 and, most recently, became a partner at Eye Care Specialists, LLC. Dr. Todd Lumsden sees patients at our Cape Girardeau Doctors’ Park and Perryville offices. He is typically available for appointments in our Cape office on Mondays, Tuesday afternoons, Wednesdays and Fridays. He performs surgery at Physicians Alliance Surgery Center Thursdays and one Friday morning a month. He is at our Perryville office on the second and fourth Tuesday of each month and performs surgery at the Perryville Hospital on the third Monday of each month. In his leisure time, Dr. Todd Lumsden loves spending time with his family, is a passionate golfer, and enjoys hunting and fishing. Board certification indicates that beyond his or her basic medical license, an entity recognized by the American Board of Medical Specialties has certified the surgeon to practice within his or her specialty. For osteopathic physicians in ophthalmology, this entity is the American Osteopathic Board of Ophthalmology and Otolaryngology (AOBOO). The AOBOO certifies the surgeon has completed specific training and continuing education related to the specialty. Click here for more information on AOBOO qualifications for certification. The suffix FAOCO indicates that a surgeon is a “fellow” of the The American Osteopathic Colleges of Ophthalmology and Otolaryngology (AOCOO). The AOCOO was established in 1908 with the objectives of improving the practice of ophthalmology and otolaryngology and developing the application of osteopathic concepts in the fields of ophthalmology and otolaryngology. The organization sets high standards for surgical education and practice. A fellow of the AOCOO has passed the rigorous evaluation and his or her education and training, professional qualifications, surgical competence, and ethical conduct meet the high standards required by the College. The following affiliations help Dr. Todd Lumsden stay abreast of technological advancements in ophthalmology and surgery. The mission of the AOA is to advance the distinctive philosophy and practice of osteopathic medicine, promote public health, and encourage scientific research. This organization is also the accrediting agency for all osteopathic medical schools. The mission of ASCRS is to advance the art and science of ophthalmic surgery and the knowledge and skills of ophthalmic surgeons. ASCRS is a primary resource for Dr. Lumsden of up-to-date clinical information for cataract surgery, published research, and regulatory information affecting the practice of medicine. The mission of (MoSEPS) is to represent Missouri ophthalmology by providing educational opportunities, legislative advocacy, and practice enhancement to members such that quality medical and surgical eye care is promoted for the citizens of Missouri.